Together with Signed Photograph with Autograph Musical Quotation. Sir Henry Walford Davies. Anglo-Welsh composer. ALS. 2pp plus integral blank leaf. Segenbalm, 21 Fawley Road, W. Hampstead, NW. June 17th 1911. To "Dear Sir" [Granville Smithurst]. "You speak of living in a 'lonely country village'. It is one of the nice things about music that a lonely village can share and enjoy the loveliest tunes by Bach and Beethoven with the busiest city. I wish you every happiness in the study and love of our art. I have added a scrap from a new Suite of mine called Parthenia, for a signature alone is a dull affair. Yours very truly, H. Walford Davies". Together with a post-card photograph showing Walford Davies, head and shoulders portrait with his gaze fixed on the camera. 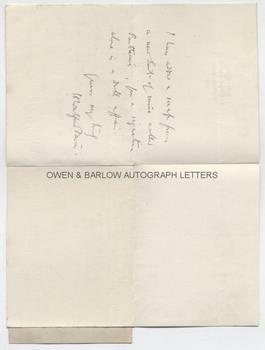 Signed and dated "H. Walford Davies. 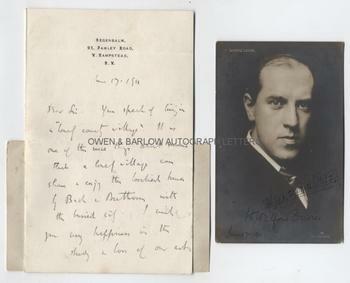 June 17th 1911", with autograph musical quotation, being three bars from his Suite, 'Parthenia' Opus 34 (1911). 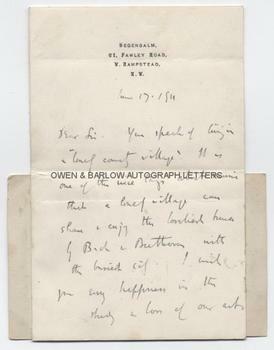 The letter is 8vo bifolium, approx 7 x 4.5 inches (18 x 11 cms), partially laid down on post-card to verso of integral blank leaf. The photograph measures approx 5.25 x 3.5 inches (13.5 x 9 cms). Both in fine condition. 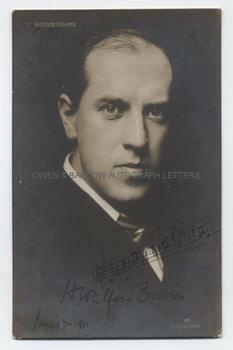 Walford Davies was appointed Master of the King's Music in 1934 in succession to Sir Edward Elgar. In addition to being a successful and popular composer, Walford Davies was also a noted teacher (Leopold Stokowski was amongst his pupils) and he was an influential writer and broadcaster on music. He was appointed as the first director of music to the Royal Air Force upon its formation in 1918 and composed the RAF March Past, a perennial favourite of military bands.